The first choice to make. There are two main types of pool available on the market. An above-ground pool which consists of a framework that sits on the ground and supports a liner that when filled with water becomes your pool. Or an in-ground pool where the shape of the pool is excavated from the ground, made solid with block work or poured concrete, and then lined to become your new pool. Above-ground pools are generally cheaper because they are so much easier to build. Although some of these pools may be as much as 30 feet long and require considerable skill to erect, at the other end of the range there are smaller pools sold specifically as DIY kits. Like all do-it-yourself projects, there are benefits and potential problems to be aware of. Even with a DIY pool kit, you are going to need some basic skills. You might need to enlist the help of friends and you might find that buying or hiring specialist tools is necessary to complete the job. A pool build is not just about physical construction. There are going to be aspects of the project that need some basic plumbing know-how and there will be some electrical work that may have to be done by a qualified electrician. Building an above ground pool can be relatively inexpensive and very rewarding and satisfying but it will almost always take the handyman longer to complete than the professional and the end result is really going to be dictated by the level of skill that you possess. For a homeowner to build an in-ground pool without professional help is a much more daunting task. However, in principle it might be possible to save somewhere between 20% and 50% of the professional build cost. A vinyl liner type in-ground pool is the easiest sort of construction method to use. Rendered or mosaic pools use an even wider range of specialist skills in the way that they are built. 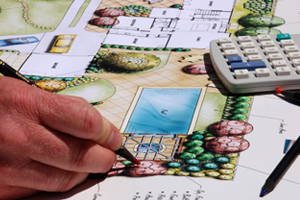 The job begins with measuring up your chosen site; not only for the pool and decking itself but also to make sure that you can access heavy machinery. Using a bucket and spade might be a nice idea but to dig out your pool you are going to need to bring in a JCB and probably a large dumper. So already you are using some outside contractors and throughout the build you are almost certainly going to have to use others – probably certified electricians and qualified plumbers. This is where that ‘between 20% and 50%’ figure comes in. You can save 20% of the build costs just by managing the project yourself, acting as the ‘main contractor’ and doing as many small jobs as you can. To get that figure closer to 50% you are going to need some serious practical skills. Swimmer Pool Kits take the worry out of specifying exactly the pool that you want. They bring together all the heating and water filtration equipment that you will need and they use a modular construction method that is both quick and dependable. Your pool heater can be specified as gas, oil, electric, solar or even using a heat pump. And just as importantly, the kit will contain all the fittings and pipework that will be needed. Every component has been sourced from the best possible supplier. Everything in the kit will work together and fit together. Everything arrives at the same time. All this means that you can start bringing your dream pool to life without worrying about delays or disappointments. We hope this article has given you some of the information that you were looking for. Having read just some of the challenges you’ll have to face in building your own pool you might now be looking for a professional pool builder. If that’s so then we can help with that as well, just use the link at the top of this article and we can find someone with the appropriate skills and qualifications in your area.